rec. St Mary Magdalene, Sherbourne, Gloucestershire, 17-19 July 2017. DDD. Telemann’s very large output encompasses a wide range of styles, with no danger of his being accused of writing the same work several hundred times, like his contemporary Vivaldi. (Not that I subscribe to that particular misapprehension.) 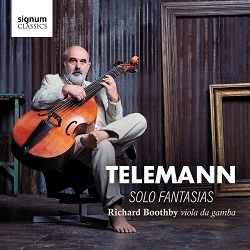 Don’t expect these solo fantasias for the gamba to match the immediate appeal of some of his music, such as his ‘Water Music’ ( Hamburger Ebb’ und Fluth), or his a-minor Suite for flute and orchestra, or his concertos based on Polish tunes. Nor should the word ‘fantasia’ lead you to expect anything like Biber’s trade-mark stylus phantasticus; Telemann’s fantasias offer music of a more intimate nature. These works are not to be confused with his better-known fantasias for solo flute and solo violin. Two of the fantasias for solo flute have recently been released on the Arcana label: TWV40:2 and 4, along with two fantasias for solo violin, TWV40/16 and 20, and three sonatas for transverse flute and violin, TWV40:101, 103 and 104. The attractive performances by Matteo Gemolo (one-keyed flute) and Patrizio Germone (baroque violin) were recorded in May 2017 and can be found on AD110 [53:52] reviewed as an mp3 press preview with pdf booklet. Though shown as released in May 2018, I can’t find it listed by our usual suppliers on disc, so I can only surmise that the release has been delayed or is restricted to streaming – from Naxos Music Library with booklet – or download only. Incidentally, some dealers seem to be offering the new Signum for download only, though others have it on CD. Re-discovered as recently as 2015, the gamba fantasias nevertheless already have other recordings to their credit. These include versions from Robert Smith (Resonus RES10195) and Paolo Gandolfo (Glossa GCD920417). Stuart Sillitoe described Gandolfo’s recording as ‘exceptional’: Recording of the Month – review – but it has apparently already fallen into the download-only category, though Amazon UK had one copy of the CD when I checked. It runs to two rather short CDs, with the addition of the Sonata in D, TWV40:1. More directly comparable with the new Signum, the Resonus comes complete on one CD which Michael Cookson thought ‘shone out strongly’ from the three Telemann recordings which he was reviewing earlier this year. I’ve had time only to sample those other recordings, without making direct comparisons. All that I can say is that we now have three very good recordings of this music. The viola da gamba was already old-fashioned in Purcell’s day, though that didn’t prevent him from writing some very fine music for it. A little before Telemann’s time, Marin Marais wrote some splendid music for the instrument, as those who have seen Gérard Depardieu in the film Tous les Matins du Monde will know. (Soundtrack on Alia Vox AVSA9821, SACD, or download AV9821 – 5-star review). Now we know that Telemann also left very fine music for the instrument. Technically difficult, though with the art which conceals art, the music receives splendid performances from Richard Boothby. Apparently, Telemann played the gamba, though not with great assurance; he included it as an optional replacement for the cello in his Paris Quartets and there are sonatas for gamba and bass continuo. Boothby’s notes in the booklet surmise that he may have had one of the French virtuosos of the day in mind when he composed these Fantasias. I doubt that any of them could have surpassed the three versions mentioned, not least the new Signum. The recording is suitably intimate and the presentation very good. The Hyperion download costs £7.99 for 16-bit, a considerable saving over the cost of the CD, while even the 24-bit version, at £12, is less expensive than most dealers charge for the (16-bit) disc. Take your pick from three very fine accounts of this music, the new Signum not the least. None of them will be my automatic choice when I wish to hear Telemann’s music, but I shall wish to return sometimes to this Signum release.